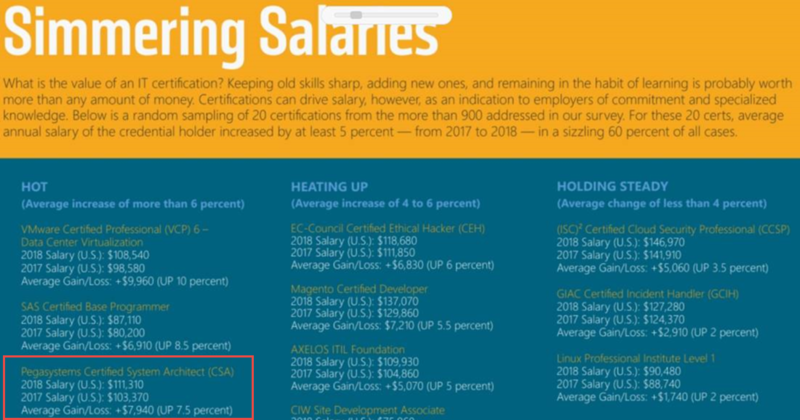 Certification Magazine’s 2019 Salary Survey results are in! Certification Magazine’s 2019 Salary Survey results just came out. As usual, Pega certifications performed very well in the survey. This year’s Salary Survey included more than 900 certifications. The Salary Survey is global, with 55% of all respondents this year from the U.S.
Salary Survey 75: The Salary Survey 75 list is ranked by average base salary among U.S. credential holders in 2019, and drawn from the certifications held by the largest numbers of survey respondents. How best to utilise and analyse the results of a survey built with Pega Survey? In Determine Offered Salary exercise, Upon Entry for Assess Candidate ends case.